The shock testing system of HSKT series are mainly applicable to shock resistance tests in such fields as electronic products, aerospace, shipping, military industry, automotive parts and transportation. 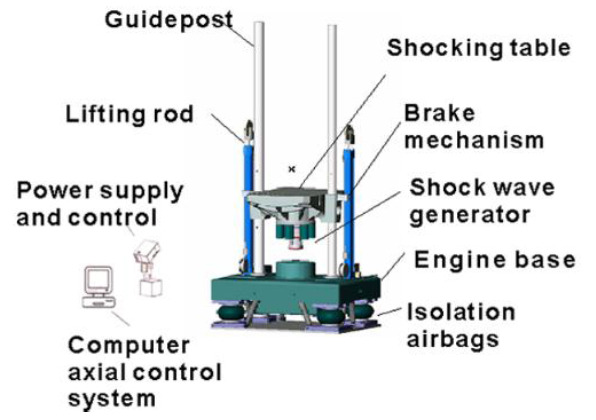 Shock tests in form of half sine wave, final peak saw tooth wave or trapezoidal wave shock tests can be carried out by selecting different waveform generators. 3 Shock measurement device: single-channel data acquisition, simultaneous acceleration data measurement, storage, report printing, data callback, database management of two channels. 4 Use of rubber module, producing a wide range of half sine pulse with arbitrary action time. 5 Availability for equivalent drop test of packing boxes. configuration No. Equipment name Model Qty. High-strength imported aluminum alloy operating platform. The lifting height is measured by a photoelectric encoder module installed on the base, and the photoelectric encoder module has high accuracy, strong anti-interference capability and high reliability, thus ensuring shock repeatability. Air brake and strong friction brake are applied to prevent secondary shock braking, thus ensuring prompt and reliable braking to prevent secondary bounce. The buffer system is consisted of a base, a damper and a gasbag. The buffer system can reduce the shock force transferred from the working platform to the ground. Emergency stop switch: It switches off the circuit in emergency cases by forcibly disconnecting welded contacts of the actuating mechanism. The system conforms to MIL-STD-810, GJB-150-18-86 and IEC68-2-27 standards, and has accurate and prompt shock wave capture capability. The max. sampling rate is 1MHz, therefore, you need not worry about omission of minor shock events. The system is also an integrated solution, you need not be busy with waveform viewing and recording, as the system can capture shock event and generate report, more importantly, the system can provide you with shock response spectrum analysis (SRS) to facilitate effective assessment of potential damage from shock pulse to the actual system. At last, the auxiliary analysis on force deformation and shock response can enable to understand more details about the shock results. It conforms to MIL-STD-810, GJB-150-18-86, IEC68-2-27 and DELL standards. The max. 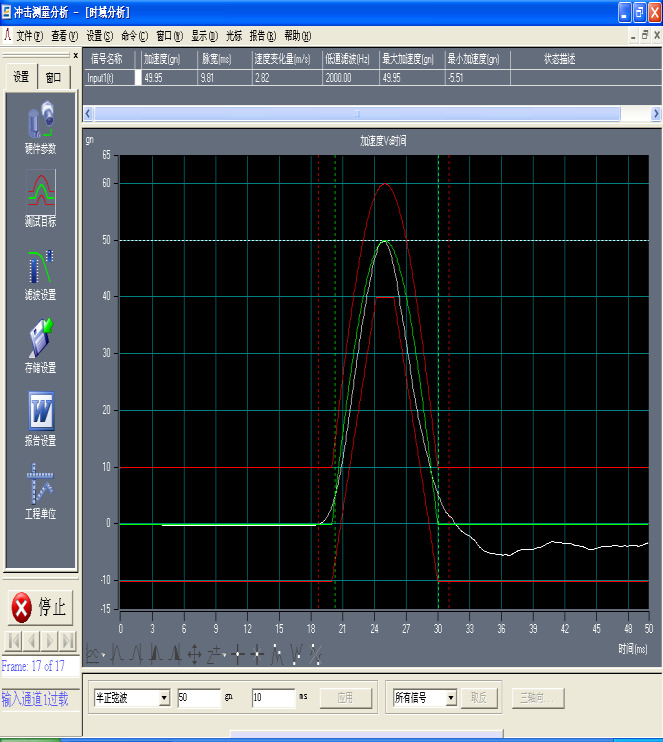 sampling frequency is up to 1MHz. The max. testing acceleration is 100000gn. The min. testing pulse width is 0.1ms. It has the features of multi-frame waveform recording and playback. It supports internal and external triggering. You can obtain single or multiple pulses with transient capture. The system can automatically analyze data of shock pulse, including peak value, pulse width, rate of speed change and head injury index (HIC), automatically match the captured pulse waveform to ideal waveform, and compare their deviation. The shock response spectrum analysis enables assessment on potential damage arising from shock, thus providing basis for designing shock resistance of products. The system can perform SRS analysis on each shock pulse, and compare the deviation between actual SRS and objective SRS. Installation location: flat ground, no corrosive gas surrounded, less dust. 5. Appropriate unloading, handling tools shall be prepared by customer.